Teach these lessons well, and fitness will be your family’s most important heirloom. Father's Day offers us a chance to thank the man who made us for all the sacrifices he makes on our behalf. Yes, even good fathers can drive kids crazy at times, and we have to forgive their occasional trespasses, like pairing flip-flops with white socks to mow the front yard. The best fathers keep us on the straight and narrow. They are our last resort anytime we stray off course and inevitably get into trouble. We have two wishes for fathers on this important day. The first wish is that they embrace health and fitness, so they can live long and healthfully enough to appreciate the fruits of their labor. The second wish is that they pass along that passion for health and fitness to their children, who can then pass it on to their progeny, etc. 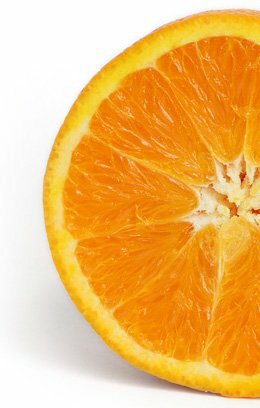 For decades, we've been led to believe that healthy nutrition is an adult necessity only, applicable once metabolism slows and health threats loom larger. So kiddie commercials champion sugary cereals, and drive-thru etiquette may as well be part of drivers' education. Our schools pump kids full of soda. The fallout: According to a new study in Pediatrics, 23 percent of all teens have diabetes or pre-diabetes. Part of the problem: Sugar, it turns out, is addictive. Steer your kids toward healthy food choices for the same reason you steer them away from booze and cancer sticks: habits form early and remain. Worrying about your kids may keep you up at night, but one of the best things you can teach them is the importance of sleeping 7-to-8 hours per night. The best way to do that is to get them exercising. A study in The Journal of Adolescent Health linked vigorous exercising to better sleep and psychological functioning in adolescents, particularly males. The reverse holds true as well: In a study of 291 female college students in northern Taiwan, participants with poor sleep quality were more likely to lack physical fitness, including muscular endurance, flexibility, and cardiovascular fitness. Fathers must engage children in discussions about drugs and alcohol. Prepare them for peer pressure before they get tempted! Do NOT be the 'cool' dad who supplies beer, or rolls joints. You will be held legally responsible. Addiction is real. Educate yourself on methamphetamines, inhalants, crack, heroin, bath salts, ecstasy, marijuana, alcohol and other drugs. Learn what they look like, and which behaviors result. Listen to your children; know their friends, what they do for fun and whether or not drugs and alcohol are present. Don't just say 'no' to drugs. Say 'yes' to a relationship with your children. Physical activity makes winners of all participants. Most athletes in youth sports will never win championships. Unfair pressure to win creates conflicts and angst among young people. Forcing your daughter to practice tennis every day will not get her into the U.S. Open. Screaming at an umpire will not get your son another at-bat. Set examples of sportsmanship and retain the respect your kids have for you. Your attitude toward opponents will resonate in them. They want to be like you, good or bad. 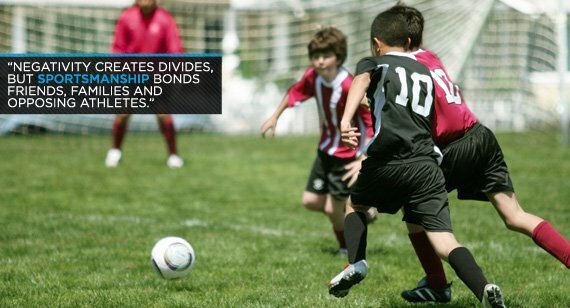 Negativity creates divides, but sportsmanship bonds friends, families and opposing athletes. They are not enemies. They are children. Physical fitness is important for your entire life, but it's not easy. Cheeseburgers and drive-thrus are easy. Health is complicated and difficult. Athletes will get injured and if they want to get healthy, they have to work at it. Instilling a good work ethic in children helps them become more productive adults. It's not just about fitness; work ethic helps children excel at school and in the workplace. Teach them how to perform tasks around the house. The skills you teach them permeate their future. Not only will your children work harder, there's a good chance they might actually move out … someday. Stress deteriorates health in ways we're not always aware of and leads us to make irresponsible decisions. Stress turns us into people we don't want to be. Successful fathers know how to handle the pressure of life. Professional padres take tests and pass several times over. It's important to watch and learn from a dad who never backs down from a challenge. Dutiful dads thrive in stressful settings and stand out from the crowd. It's not easy carrying the burden put on fathers. They handle stress in ways that leave us looking for a pen and paper to take notes. 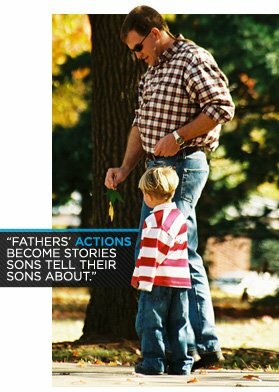 Fathers' actions become stories sons tell their sons about. Life is full of deterrents that can throw us off course at any moment. A real man knows how to clear a path through the smog and get to the other side unscathed. We look up to our dads and follow their lead. Boys want to be dads one day. You know a strong dad when you see one; still smiling even when everything goes wrong around him. It takes a strong and confident man to lead. If it were easy, everyone would take a stab at fatherhood. Fathers are more than genetic donors. They are leaders who embrace their role and shine when the going gets tough. We look up to our dads because they show us how it's done right. We're constantly bombarded with reasons to feel bad about ourselves: We're never as attractive, smart, wealthy or successful as we can be. Although it manifests differently, children are also subject to pressure to succeed. As a dad, you're integral in helping your child maintain a positive self-esteem. Encourage and compliment your child's accomplishments - no matter how small - to promote their confidence. Teach them that small victories are meaningful and important, that their work does not go unnoticed. Children with good self-esteem are less likely to be depressed or delinquent; they're more likely to succeed in school and have friends. A dad who promotes healthy competition instills confidence in his child. For children, winning a race to the car, a game of chess or an intense game of HORSE against their father (even if he lets them) is a giant leap for their spirit and tenacity. Teaching your children to compete, whether they win or lose, helps them become self-reliant, determined and assured. Competition doesn't have to come on the soccer pitch or baseball diamond; if your kiddo is more into theater or music than basketball, encourage him or her to compete for the lead role or the first chair. Competitive courage is valued in every facet of life, for children and their fathers.